Despite the considerable numbers of Ruthenian and Ukrainian immigrants to the United States from the Austro-Hungarian Galicia and the Ukrainian "gubernias" of the Russian Empire, there has been a singular lack of support for genealogists and family historians interested in researching their ancestors from those regions. To remedy this, the Ukrainian Historical and Educational Center has launched its Family History Group project. This first event of the project was a half-day workshop that took place on March 22, 2014. 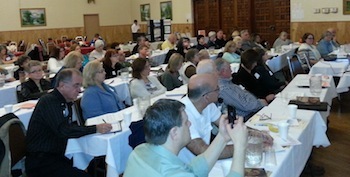 It was extremely well-attended, reflecting the need and desire for such a resource in the Mid-Atlantic region. The nearly 50 participants came primarily from New Jersey and the New York and Philadelphia metro areas, but included attendees from as far away as central Connecticut, the "Coal Region" of Eastern Pennsylvania, and the Washington DC area. Joining the Center in organizing the event were the experienced genealogists Michelle Tucker Chubenko and Michael Buryk. Michelle presented an excellent general introduction to genealogical sources available in the United States, including immigration records, census records, military service and draft records, naturalization papers, and general sources like gazetteers, city directories, and local newspapers. She provided some of the background knowledge needed to effectively use these records, such as how the processes of immigration and naturalization worked during different time periods in US history, and how ethnicities were identified on US census forms. The workshop's featured guest Diana Howansky Reilly, a Fulbright scholar, presented her 2013 book "Scattered: The Forced Relocation of Poland's Ukrainians after World War II" . It presents a glimpse into the many hours of research she conducted on Operation Vistula and its impact on her family's history. Diana reviewed the post-war Polish government's policies of reducing the threat of ethnic tension through voluntary (and later forced) relocation and ethnic cleansing. Her readings spanned her family's history, from pre-war life in Smerkov, Poland through the outbreak of war through final resettlement. By making the connection to the "real people" of her own family, the book and her presentation brought to life what would otherwise be dry historical facts. Diana also spoke of the Polish archives that hold documents of the relocated and repatriated Ukrainian, Lemkos, and Rusyns, and she gave research tips on how to request information about family members who might have been relocated or repatriated. The workshop concluded with a brief introduction by the Center's archivist Michael Andrec on the records of genealogical interest that are held in the Center's repository, and under what situations one is likely to find relevant information there.